Ahmad Ghabel, the progressive Muslim scholar, political dissident, and ardent critic of Ayatollah Ali Khamenei and the doctrine of Velaayat-e Faghih [the rule of the Islamic jurist, represented by the Supreme Leader in Iran’s theocratic system], is in a coma and was declared legally brain dead on Tuesday October 16. Ghabel had been suffering from a cancerous brain tumor. Ghabel was born in 1954 in Fariman, a small town south of Mashhad, the provincial capital of Khorasan Razavi province. He was a son of Sheikh Mohammad Ghabel who was also a religious scholar and was from the town of Torbat Jam, a town in Southern Khorasan province. Mohammad Ghabel had studied in Najaf’s seminaries in Iraq, and then had returned to Iran. Ahmad’s brother, Hadi Ghabel, is also a progressive Muslim, a political figure and a prominent member and leader of Islamic Iran Participation Front, Iran’s largest Reformist political Party that was outlawed in the aftermath of the rigged Presidential elections of June 2009. Hadi Ghabel was also arrested in April 2008 by the Special Court for the Clergy, an extrajudicial and illegal court system that tries to monitor and control dissident clerics. He spent over two years in jail and was released in 2010. Ahmad Ghabel studied in Mashhad, where he graduated from high school, after which he moved to Qom to study in its seminaries. He was a student and disciple of Grand Ayatollah Hossein-Ali Montazeri (1922-2009) , the spiritual leader of the Green Movement, who also was a harsh critic of not only Khamenei for which he was put under house arrest for several years, but also Ayatollah Ruhollah Khomeini over the mistreatment of the political prisoners in the 1980s and the execution of thousands of them in that era, and in particular over 4500 of them in 1988 , which prompted Khomeini to sack him from his post as Deputy to the Supreme Leader. Ghabel progressed rapidly in his religious studies. He fought in the Iran-Iraq war and was injured. He did work on a thesis on critiquing rajm [death by stoning as the punishment for adultery]. He demonstrated such deep knowledge and understanding of Islamic teaching that in 1998 Grand Ayatollah Montazeri publicly recognized him as a mojtahed [Islamic scholar who can issue religious edicts], although as early as 1993 Ghabel had unofficially received such recognition from the Grand Ayatollah. The distinction was also recognized by several other Grand Ayatollahs. Up until a few years after the 1979 Revolution, Ghabel was a cleric. But, he gave that up, and although still a Muslim scholar, he no longer appeared in public with the clerical frock and clothes. Ghabel was first arrested on December 31, 2001 and spent 125 in solitary confinement. He was accused of acting against national security, insulting Khamenei, and propaganda against the political system [the nezaam], the usual charges made against defenders of human rights and the political figures in Iran. But, he was eventually released after posting a bail. After his release he moved to Tajikistan and lived there. Right before the June 2005 presidential elections, Ghabel wrote a public letter to Khamenei  in which he criticized him at an unprecedented level, accusing him of, (i) encouraging use violence against his opponents; (ii) silence when his old friend Habibollah Ashoori  was accused of apostasy and was executed [who was executed on September 18, 1981 in Tehran]; (iii) ordering the house arrest of Grand Ayatollah Montazeri and declaring that, “so long as I live, he [the Grand Ayatollah] will be under house arrest;” (iv) making the baseless claim that Israel was the culprit behind the infamous Chain Murders ; (v) ordering closure of leading Reformist newspapers; (vi) creating constant crises for the administration of former President Mohammad Khatami, (vii) preventing charging and putting on trial of the infamous Judge Saeed Mortazavi, the main culprit in the murder of Dr. Zahra Kazemi, the Iranian-Canadian photojournalist that was murdered in 2003 in the Evin prison, and (viii) pursuing a foreign policy that has isolated Iran. Upon his return to Iran, Ghabel’s passport was confiscated and he was barred from leaving Iran. When his younger brother Hadi was arrested in April 2008, Ghabel wrote another public letter to Khamenei  in which he again accused Khamenei of absolute dictatorship, saying, “That Mr. Khamenei insists that nobody’s view is important but his, and that, for example, no one should express any opinion about Iran’s nuclear program, indicates nothing but absolute dictorship,” and, “I am waiting for the day in which he [Khamenei] is put on trial.” Eventually, Hadi Ghabel was sentenced to 40 months of incarceration, defrocking, and a fine of 5,000,000 rials. After Grand Ayatollah Montazeri passed away in December 2009, Ghabel was traveling to take part in his funeral, but was arrested in Nishapur [Nishabur], a town west of Mashahad. On the same day, two human rights activists, Shiva Nazarahari  and Mahboubeh Abbasgholizadeh were also arrested , while traveling to Qom to take part in the funeral. Ghabel was put on a show trial in May 2010, and charged with giving [anti-government] speeches in Mashhad, Fariman, and Najafabad [birthplace of Grand Ayatollah Montazeri], granting interview to the foreign mass media, and criticizing Khamenei in a letter that he had written to him. He rejected all the charges. He was brought to the court with his feet chained. Given the respect that Ghabel had earned in the religious establishment, even Judge Kavoosi who was presiding over his trial ordered  that he should no longer be brought to the court with chained feet. While in jail, he became severely ill. He was taken to a hospital, while chained and under strict control by the security agents. (Mrs. Marzieh Pasdar, Ghabel’s wife recounts this here .) His illness forced the regime to release him, fearing his death in prison. Thus, after spending 170 days in prison, Ghabel was released on July 1, 2010, after posting another bail. 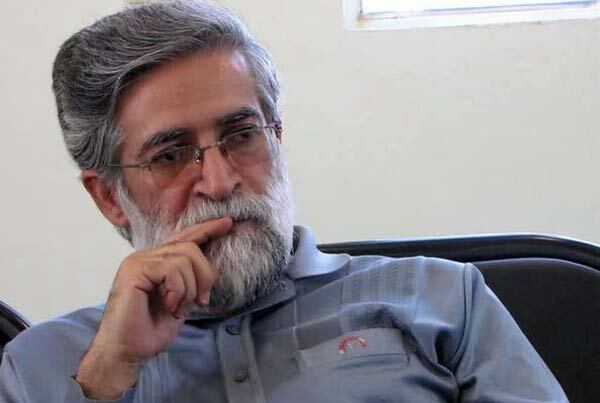 But, he was again arrested a short time later, after he revealed  in an interview with Voice of America that a large number of people had been secretly executed in the Vakil Abad prison in Mashhad. On December 10, 2010, Ghabel was sentenced to 20 months, and was incarcerated shortly afterwards. Except for medical furloughs, he remained in jail until he was taken to hospital for the last time, when he passed away. Ghabel published two books. One was  Naghd-e Farhang-e Khoshoonat [a critique of culture of violence], published in 2002. It was a collection of his speeches, articles, and essays in which Ghabel had rejected use of violence as a means of addressing social problems. The second book that remained incomplete is  Mabaani-ye Shariat [fundamentals of the religion]. He was also working on another book, Shariat-e Aghlani [wise religion], up until the last few weeks of his life. One of the thorniest issues in Iran, debated fiercely by ordinary people, feminists, and even Islamic scholars, is whether the hejab [Islamic cover] is mandatory for women. Ghabel studied the issue extensively and intensively, and wrote Estehbab-e Poosheh-e Banovaan [critique of mandatory hejb for women] . Ghabel believed that  the main issue is cover for a woman’s body, not necessarily her head and neck, saying, “I do not understand where such sensitivity about hair [of a woman] has come from?” He was also strongly against discrimination against women, and rejected any interpretation of the teachings of the Quran that is against rationale and wisdom . On June 22, 2012, Ghabel publicized  what he referred to as his political will in which he fiercely attacked the fraudulent election of 2009, calling it a coup. He recounted the events that had led to the huge demonstrations in the immediate aftermath of the elections, and warned that the only way to return piece to the nation was for the coup leaders  to return to implementing the laws, and recognizing the people’s rights.